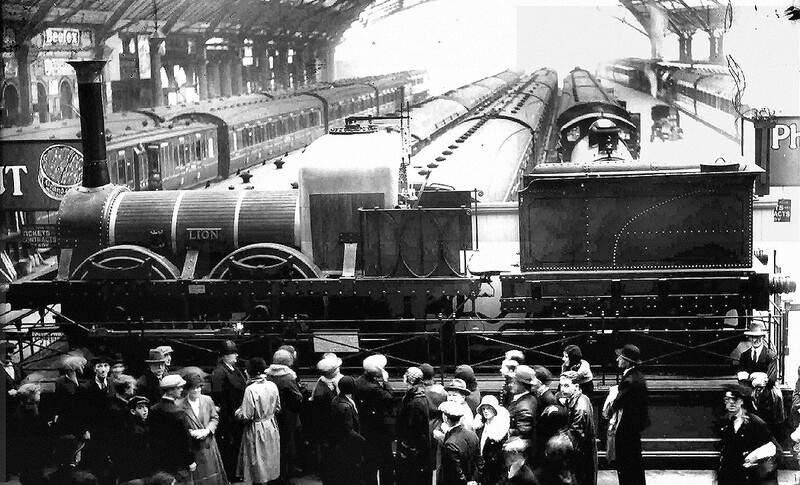 in Lime Street station in the early 1930s. 'Lion' was built in 1838 by the short-lived partnership of Todd, Kitson and Laird in Leeds for the Liverpool and Manchester Railway. The following . The original text has been retained and only minor changes have been made. 'Perhaps the most interesting feature of the Liverpool and Manchester Railway Centenary Celebrations, held at Liverpool from September 13th, was the "Train of 1830" drawn by the reconstructed "Lion", which carried passengers round a circular railway specially laid down at the Wavertree ground. According to Wishaw, this locomotive was built for the Liverpool and Manchester Railway in 1838 by Messrs. Todd and Co. It now appears that the company consisted of Charles Todd, James Kitson and a Laird, and that they began manufacturing early in 1838. In 1839 Kitson and Laird withdrew and started a new firm, which has developed into the present Kitson and Co., while Todd continued the original business with a new partner under the title Shepherd and Todd of the Railway Foundry. After 1846 the foundry was carried on by E. B. Wilson and was eventually acquired by Messrs. Manning, Wardle and Co.
Two engines, the "Lion" and the "Tiger," were built at about the same time; the "Lion" is believed to have been delivered in July, 1838, and both were at work before October of that year. Edward Woods, the company’s engineer at that time, when sending out a specification for new boilers, quoted these engines as examples to be followed as regards materials and workmanship. The "Lion" was No. 57 on the company’s list and was taken over, with other stock, by the Grand Junction Railway in August 1845. In 1846, when the London and North-Western Railway was formed by further amalgamation, it became No. 116 of that line. The "Lion" was sold for the sum of £400 to the Mersey Docks and Harbour Board on May 26th, 1859, and worked as a pumping engine at Princes Graving Dock from that date until August 1928, when it was presented by the Board to the Liverpool Engineering Society, whose property it remains, in order that it might be preserved for the city of Liverpool. It has been restored during the present year in the Crewe shops of the London, Midland and Scottish Railway, with the assistance of Mr. J. G. H. Warren. The engine is of the inside cylinder, 0-4-2 type, which was one of the forms of six-wheeled engine introduced by Robert Stephenson in 1833, and extensively copied by other engine builders. The cylinders are now 14in. diameter by 18in. stroke, but the figures given by Wishaw in 1840 were 11in. diameter and 20in. stroke. In a list of about 1846, by John Dewrance, who succeeded Eward Woods, the cylinder diameter is given as 12in. and the stroke as 18in., so that it would appear that the cylinders were changed for larger sizes ar least twice, but the changes were no doubt made before the engine ceased work as a locomotive. The driving wheels are 5ft. diameter and the trailing pair 42in. diameter. The wheelbase is 12ft., equally divided. The cylinders are placed low down so that the piston-rods pass below the leading axle with an upwards inclination of 1 in 13. The valve chests are placed on the tops of the cylinders, as was then usual, and the valves are driven through rocking levers, the upper ends of which are connected with the valve spindles, while their lower ends carry pins with which the excentric rods engage. The valve gear is of the four-excentric type, introduced in 1835, in which, for each cylinder, there is a fixed excentric for each direction of motion, and the excentric rod ends are provided with notches or gabs that engage with the pins on the valve levers. The gabs are furnished with spreading jaws or forks, which enable then to engage with the pins without the aid of hand levers on the footplate. The reversing gear is that variety of the forked gab type introduced about 1840 and usually associated with the name of William Buddicom, who was Edward Wood’s assistant at the Liverpool end of the line. In this form the forks of the excentric rods face one another and the rod ends are linked to levers on a reversing shaft placed below them, so that both are lowered or raised together, and either the upper or lower gab is engaged with the pin of the valve lever. The valves now on the engine have an outside lap of 13/16in. and a travel of 3 13/16in., the cut-off being 81 per cent. When the engine was built the valves had little or no lap, but Woods records that all the Liverpool and Manchester engines were altered or provided with new cylinders and valves, with lap and longer travel, between 1840 and 1842. It was probably at that time that the 12in. by 18in. cylinders were fitted, and very likely the present valve gear as well. The engine has outside sandwich frames of wood between iron plates, the axle-box horns being bolted to them. Inside the wheels there are two wrought frames – extending from the smoke-box to the fire-box – which carry extra bearings for the crank axle only. The springs for the coupled axles are mounted above the frames, and those for the trailing axle below them. The boiler and cylinders are are supported by brackets from the outside frames. The guide bars are carried at the front end by the cylinder covers and at the rear end by spectacle plates hanging from the middle boiler support. The present boiler is of comparatively late date, somewhat larger than the original one, and having a very high fire-box crown. It is not certain what kind of outer fire-box the "Lion" originally had. Liverpool and Manchester engines of the period usually had a slightly raised crown, but Kitson and Laird appear to have favoured the haystack form in their early engines, so that, if they had a free hand in the design of the "Lion", its fire-box may have had that form. In the reconstruction the high crown of the existing boiler has been masked by a cover of the haystack form. Whishaw gives the original boiler dimensions as:- Barrel, 39in. by 42in. and 7.4ft. long; 126 tubes, 1.625in. diameter diameter and 8ft. long; inner fire-box, 30in. long, 39in. wide and 36in. from grate to crown. The total heating surface was 460.3 square feet and the grate area 8.12 square feet. The steam pressure was 50 lb. Per square inch and the tractive effort at 85 per cent. Boiler pressure is 2499ib. with the present cylinders. The regulator is within the fire-box crown, which is surmounted by two lever safety valves loaded by Salter spring balances; these balances also serve to indicate roughly the steam pressure. Edward Woods’ boiler specification of October 1838, required a dome over the firebox with one safety valve, as well as a second dome, another safety valve on a pillar, and a manhole on the boiler barrel. The weight of the "Tiger", which was closely like the "Lion", is given by Whishaw as 14.47 tons; in its present state the "Lion" weighs 18.85 tons. The four-wheeled tender has been adapted from an early tender from the Furness Railway, and is very similar to those in use about 1840. The engine and tender together weigh 26.55 tons, and their overall length is 32.74ft. The train drawn by the "Lion" consisted of replicas of the first and second-class coaches of 1830, evidently based on the well-known Ackermann prints. The first-class coaches were excellent copies of the reconstructed model of the coach "Experiment", dated from 1834, now belonging to the L.M.S. Railway; but the second-class vehicles, while being apparently copied from the Ackermann prints, were incorrect in that they were seatless. The tickets issued for these were described at the booking office as "third class" instead of second; third class did not, of course, exist in 1830. 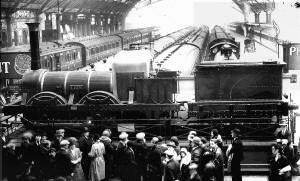 The "Lion" is to be given a place of honour at Lime-street Station, Liverpool, over the buffer stops between platforms Nos. 3 and 4'.